With holidays here and the craziness of shopping, baking, planning, traveling… it is so important for us all to just slow down and take the time to make memories with our children. It is so easy for me to get wrapped up with my to-do list that I need to be mindful of what the holidays really means to me and my family. We love crafts over here and I try to have simple and fun activities and crafts to keep my preschooler busy. I am sharing an easy and fun craft for your kiddos using supplies you probably already have around your house! 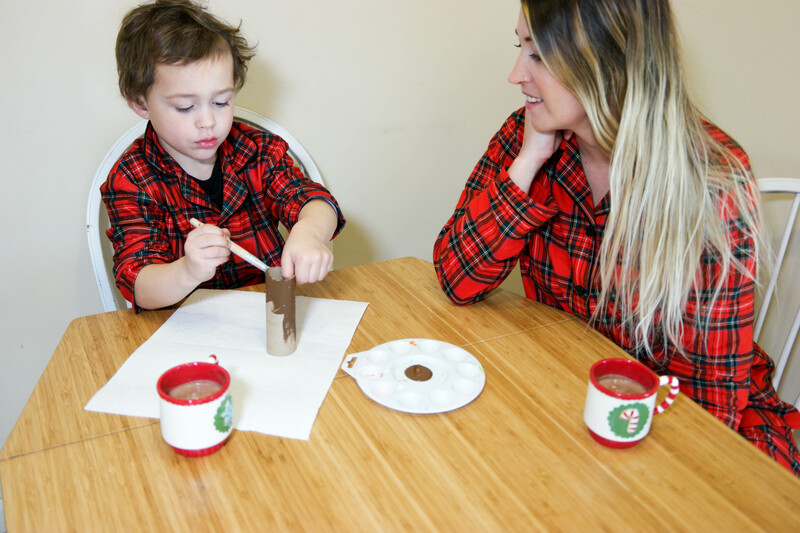 Grab a cup of hot cocoa, put on your favorite holiday music and get ready to make lasting memories with your children. Paint the cardboard tube with brown paint and let sit to dry. Once the cardboard tube is dry, help your child glue the tree to the cardboard tube leaving some tube showing as the trunk of the tree. You can make a few of these and have your kids gift them to neighbors or friends! We made a few trees because Liam just didn’t want to stop glueing! Want a reason to have a playdate? While the kids are on holiday break, invite some friends over to make several of these trees to gift to your local senior citizen home. They will be so proud to give out their masterpieces and learn the joyful feeling of giving. Looking for more great crafts and activities ? Head to the Goldfish crackers Pinterest page for great holiday activity, craft, and mix ideas to create those Goldfish moments together as a family. Did you know Goldfish crackers are colored naturally using plants?? To learn more about how each color cracker is made go here! I hope you got to spend some quality time with your family during the holiday break! What an adorable idea! Our sons are about the same age and mine would love this. Glad I checked it out! I have to try this out with my little ones this week. They love arts and crafts. This is adorable! My kids would love yo do this craft! This is so cute! Looiks so fun, gonna try with my kids this month! Always looking for fun crafts to do! Oh my goodness, this is the cutest craft! And it looks so easy. My son would eat all the goldfish though!! Cute idea! I’m not sure how many of the fish would make it on our trees but I might just have to find out! This is so sweet! I can see my baby doing this craft project with me. One for the tree, one in my tummy. One for the tree, one in my tummy. YUMMY!! 😀 Thanks! This is such a great craft idea! Thanks for sharing. This is so cute and so easy! I’m going to give it a try. I love crafts like this. We are always on the hunt for easy activities with snacks included! Thanks. Thank you !! Us too ! Very cute idea and i love your photography! What a cute craft idea! I also love your matching pajamas!! I love this idea! I was actually looking for cool crafts to do with my son. We will definitely try this one. Thanks for sharing! This is such an easy cute craft! Love it. We just bought a huge thing of gold fish crackers so maybe we’ll give it a try! What a great Christmas idea and I love the jammies!!! How fun.